One cannot choose the family they are born into but we can decide what to do and how to live with the family we get. It is also up to us to decide who we become – someone we should be or who our parents want us to be. No matter how hard is the present day, it is the future that matters, and at the end of the day, it is all about the paths we chose and the desire to build something in the future that awaits us. We either turn into big dreamers or end up with a small number of accomplishments. And even then we cannot be sure to what direction life will take us, except for one dream destination – The Glass Castle. 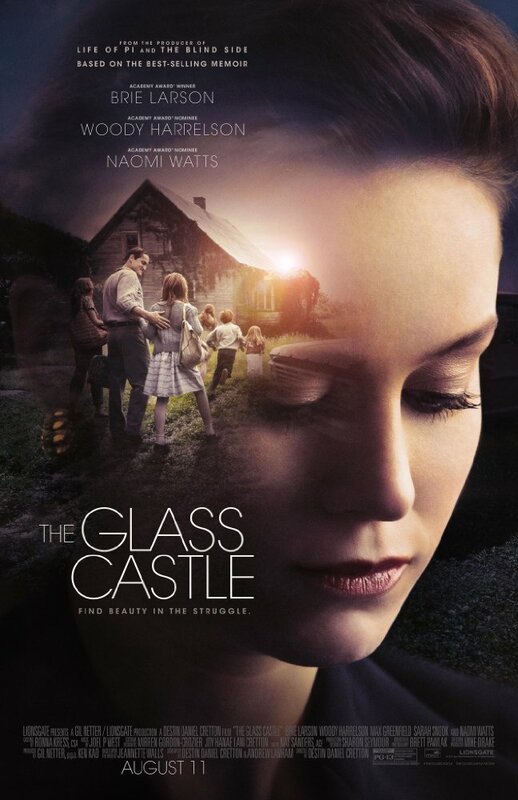 Based on Jeannette Walls’ bestselling autobiographical novel, “The Glass Castle” follows the adventures of Walls family. Their story goes from bad to worse, and little Jeannette struggles to keep the balance between her alcoholic father and the demons he fights with. As time passes, their dysfunctional family’s fate becomes more tragic. Eventually, they realize a village is needed to build their dream Glass Castle, but they do not have one. The father of the family – Rex (Woody Harrelson), drinks too much. Because of that problem, he loses one job after another, unable to provide his family, and they constantly have to move from one place to another. The film starts on a different note. We meet Jeannette (Brie Larson) as an accomplished writer, who writes for a New York journal and is going to get married to a handsome young man. On her way from a restaurant, she meets a homeless man. Then, we also see a woman (Naomi Watts) who is searching for something in the garbage bin. Those people are Jeannette’s parents. “Why won’t you leave him?” Jeannette asks her mother once when she realizes Rex’s behavior is becoming unpredictable. Having no other answer, her mom admits that she has been in love with him for ages. Years ago, her future husband was the first to notice her talent, which her parents ignored. However, that love is not enough to build the little heaven under the sun for their family. At times, they cannot even afford bread for their little kids, let alone a proper meal. They face many ups and downs. Eventually, it is Jeannette, who is able to influence her father to stop drinking and work toward their dream to build a house. But that dream will not be easy to achieve. Soon, Jeannette and her siblings realize that they should take the matters into their hands if they want to change their lives for the better. It is amazing, though, that even being through hardship and poverty, the family does not lose the magical bond they share. And one day, that magic will shine again in a very sentimental way. In conclusion, “The Glass Castle” is an outstanding drama about a troubled family. With enough money, they could’ve been the best family in the world. Rex is a very intelligent man, who finds it difficult to overcome his alcoholism. He is a big dreamer, and that seems to be contagious, as his vibrant spirit influences others. There’s one thing we know about him – even though he cannot support his family, he can give them the happiness and unity, that is not easy to find nowadays and that cannot be bought with money. It is important to mention the brilliant cast of this wonderfully charming film. Woody Harrelson as Rex Walls, Naomi Watts as Rose Mary and Brie Larson as Jeannette are great in their roles of Walls family members. The scenes they share together are an absolute delight that can be compared with the most delicious slice of cake. The film delivers a touching and inspiring concept, this is so important to be aware of. I often hear that kids from poor families or those who have parents like Rex have no future. In fact, they do. In the end, there are many life-changing revelations we can take away from this film. It comes to show us that the family bond cannot be broken and that one should not give up on anyone who cannot make it through. Just give them a chance to grow, and they will make us feel proud of them. It’s all about the chances we all must take, and the Walls family is a real example to that.